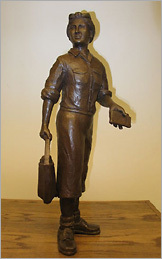 Photo by Linda Comins Moundsville native John Mowder created this bronze sculpture, "Going Home," to honor the women who worked in the factories of his hometown. The new sculpture, which is 32 inches tall, is on permanent display at the Moundsville-Marshall County Public Library. As an 8-year-old boy growing up in Moundsville, John Mowder was awed by the women who worked in factories but also read library books. Now, 54 years later, the sculptor and painter has sculpted a tribute to those hard-working women from his hometown. The finished work of art - a bronze sculpture titled "Going Home" - has a home in the Moundsville-Marshall County Public Library, where Mowder took his first art class. "I am happy to share this tribute to an important era in my hometown's history and pleased that she is at home in the Marshall County Library," Mowder, 62, said regarding his art work. The new sculpture is on display in the library's meeting room. Head Librarian Susan Reilly said Bob Strawn from the Marshall County Board of Education constructed a wooden podium to hold the sculpture. An opening reception in honor of Mowder is planned at the library, 700 Fifth St., Moundsville, at 4:30 p.m. Tuesday, April 22. The event is free and open to the public. Asked what inspired him to create this work, Mowder explained, "Often mature artists explore memories. We like to focus on what made great impressions on our lives and sometimes feel there is a value in sharing them. I am especially pleased that the Marshall County Library has given a home to this memory art," he added. The sculpture is a 32-inch bronze. It was cast from the original clay at the Studio Foundry in Cleveland, Mowder said. Describing "Going Home," the sculptor said, "The figure is of a middle-aged factory worker waiting to go home. She carries a bag that contained her lunch and purse or an item shared with her fellow workers. The other hand holds a time book. Her gaze is beyond the factory with thoughts of the jobs and joys of home." The female factory worker is a representational figure, rather than an image of a specific person. "I do not use models in my sculpting as I prefer the challenge of giving form to memory," the artist said. "I do reference by way of asking questions and understanding what made an impression on the public." Mowder, who has also worked as a fine artist and commercial artist and owned a gallery in Pittsburgh, shared his impressions of the factory workers and recalled his introduction to the wonders of a library. "This 8-year-old thought it odd that women who worked at the factory were going to school in the summer," he said. "Books meant school and summer meant no school." "That same year I discovered the half of a storefront that served as the Marshall County Library. I knew then that these women were not in school. These women were leaving those factories far behind them by way of the books they borrowed free from the library. I think that was my first realization that society gets together for good things - a free library," he commented. The new, current, library was built in 1962. "A teacher at Moundsville High School offered to teach a free art class in the basement. It was here that I had my first art class," Mowder said. Reilly has a copy of a News-Register article announcing that 24 students were enrolled in the new art class sponsored by the Moundsville chapter of the American Association of University Women. A photograph, taken by News-Register staffer Jim Cochran, accompanied the article and showed Mowder and two other students with art instructor Robert Carroll. Reflecting on the era depicted in the sculpture, Mowder said, "Growing up in Moundsville, W.Va., most of the women that I knew worked in factories. They learned to work on assembly lines during World War II. After the war, they continued working on assembly lines at the Louis Marx Toy Factory, U.S. Stamping, Fostoria Glass and Kleeson Sewing. These women worked eight-hour days in the factories and then went home to keep a clean house, tend a garden, do a favor for a neighbor, wash clothes, cook meals and raise a family." He added, "During my college years, I learned valuable lessons working alongside these women - my neighbors, my aunt, my mother, my grandmother. The values and work ethics that I learned from these women have served me well. I believe that anyone fortunate enough to know them benefited. They were an important defining thread in the culture of the town." Mowder commented, "I have always found strength in remembering those people who became adults during the Depression, happy to have a job, regardless of how humble. How they cooperated on the assembly line! How they shared their creativity in ways to make do! How they shared the joys of making the best of what little they had! How, if you just kept working, things would always get better! I hope that this sculpture reminds people of those values and of an important time that made their hometown special." Now a resident of Pittsburgh, Mowder has done circus paintings and has painted scenes and impressions related to real-life experiences. His abstract and figurative paintings, collages and drawings are described as "a record of a dreamscape uniquely his own." His realistic sculpture "gives life to history." He holds a Bachelor of Arts degree in art education and a Master of Arts degree in painting. The artist observed, "I have enjoyed a long and prolific career in which I have explored all contemporary and traditional media and styles of art. I was among the first art teachers hired by Marshall County schools where I taught for three years as well as WVNCC (West Virginia Northern Community College). While teaching at Union Junior High, I also did night classes at the Wheeling Commercial Art School which was over Kirk's (a former art store in Wheeling)." At WVNCC, Mowder taught art appreciation and painting while finishing his Master of Arts degree at West Virginia University. "I have been a fine and commercial artist since then. In Pittsburgh I owned and operated a gallery representing 40 professional Pittsburgh artists. These days I am fortunate to spend all of my time on making art that I want to make," he said. Mowder's gallery, Bloomfield Artworks, opened on Liberty Avenue in Pittsburgh in 1996. Before opening the gallery, he spent 25 years traveling with circuses for six months a year and working at his studio in Pittsburgh the rest of the year. Writing about Bloomfield Artworks for Contrast, Pittsburgh's art forum, artist Lyn Ferlo stated that the gallery "has provided Bloomfield with the spectacle of people overflowing the doors as John (Mowder) has cheerfully hosted artists of all disciplines in the beautiful space. John is dedicated to providing Pittsburgh artists a venue to exhibit their work and to providing Pittsburghers a place to see and purchase it." Ferlo also said of Mowder, "As a gallery owner, he is an artist's dream ... As an artist, his work is unsurpassed in his use of color and compositions ...The work is not frivolous. It is the world of an intelligent man who sees far beyond the everyday and wants to share with you the gift of happiness."